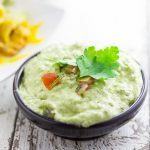 Earthy roasted poblano pepper mixed with zesty garlic and onion combined together in this smooth Creamy Roasted Poblano dip will be your new favorite go-to dip! Set aside 1 garlic clove. Place poblano peppers, onion, and the remaining garlic cloves on a large baking sheet. Brush the peppers with 1 tablespoon olive oil, and toss onions and garlic in the remaining tablespoon. Place in the oven to roast for 20-25 minutes, until all vegetables are tender and cooked through. Once the roasted vegetables are cooled down enough to touch, place all in a food processor, along with the reserved fresh garlic clove. Add sour cream and salt and pepper to taste. Process until fully combined. Serve dip warm or cold. It's delicious warm with or on tacos or taquitos, and excellent cold as a tasty guac alternative with chips.